Most of us have a love-hate relationship with coasters. They’re super useful, keeping your furniture safe from water stains – but at the same time, coasters aren’t cute. Most are plain, purely functional and completely unmatched to your beach décor. Yet you can take your coasters from dull to beachy. 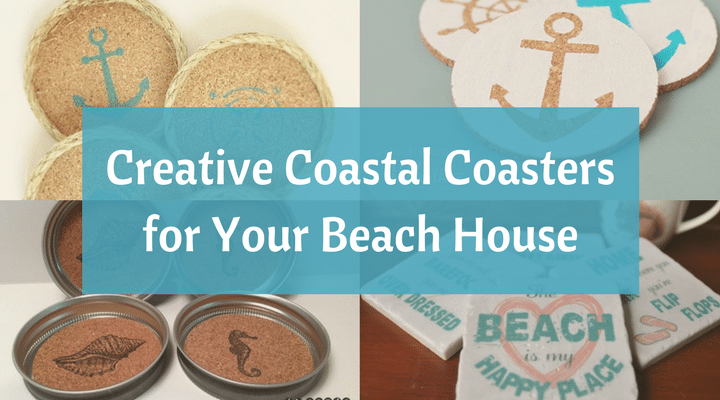 All you need is the right coastal coasters for your home, and you can evoke the ocean, the sun, and the sand every time you set your glass down. 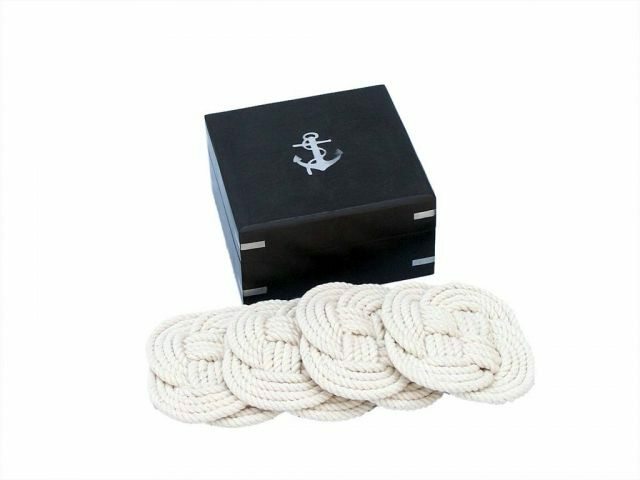 What better to bring the ocean into your living room than rope coasters shaped into nautical knots? The coasters themselves are perfect, and you’ll discover the box arrive in is too. 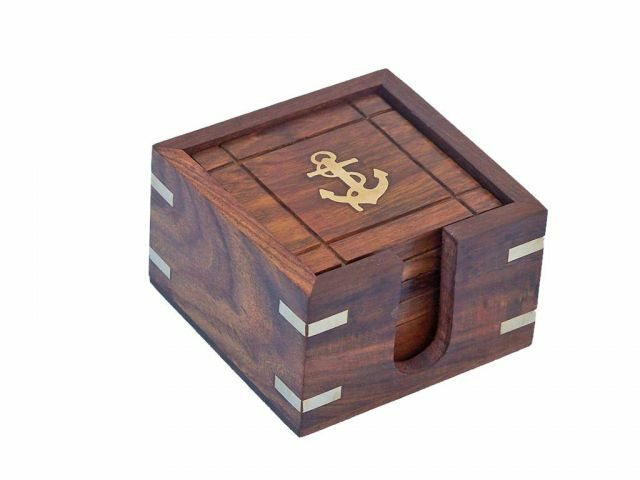 Packed in a rosewood box with an anchor on top, this is a set for any beach lover. You can find these nautically inspiring coasters at BBL’s store here. Get crafty, and you can turn plain coasters into your very own ocean-themed piece of décor. 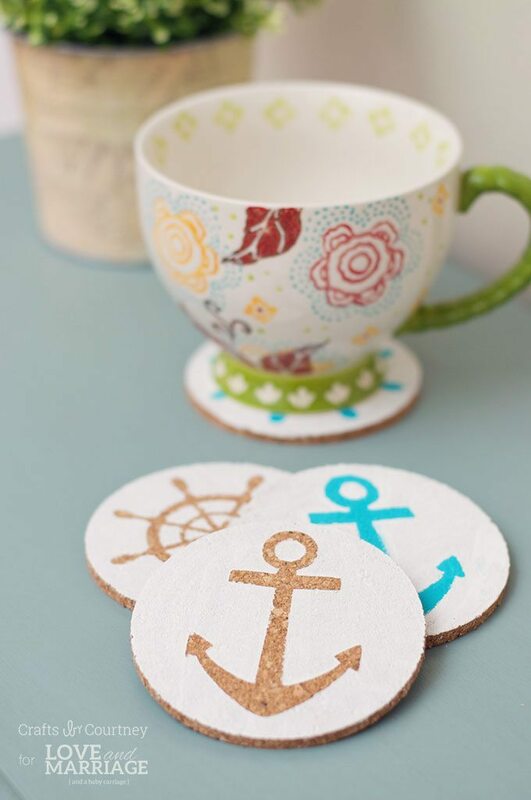 With paint and beachy stencils, you can create coasters adorned with anchors, boat wheels and more. Get creative, and you can even top your DIY coasters with shells, too. You can follow the instructions created by Love and Marriage Blog to make your own set. When you’re looking for perfectly beachy accents, don’t forget what lies below the surface of the sea: shells and marine life. 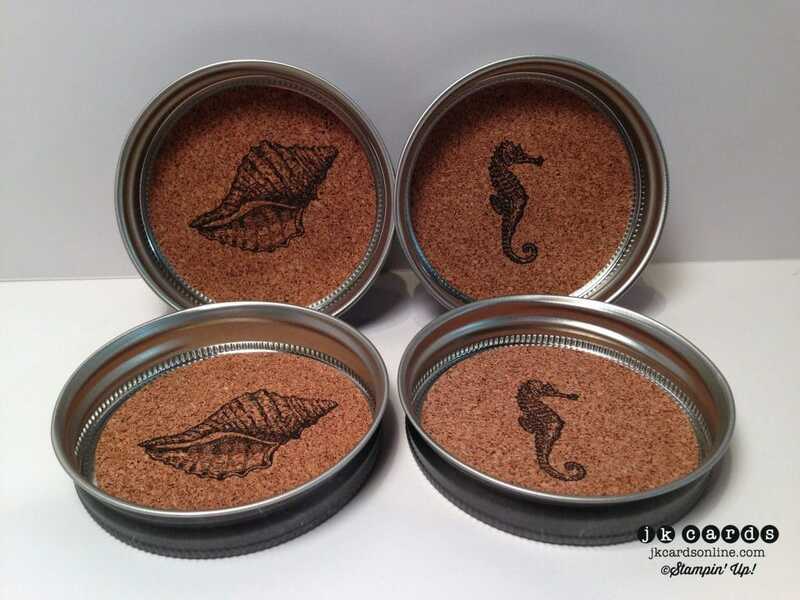 JK Cards Online offers a fantastic set of absorbent coastal coasters adorned with seahorses and simple shells. These attractive cork-and-metal coasters are certain to catch your drink’s drips and your visitors’ eyes. Displaying gorgeous shells and sand dollars is the perfect way to add a little more of the ocean to your home. 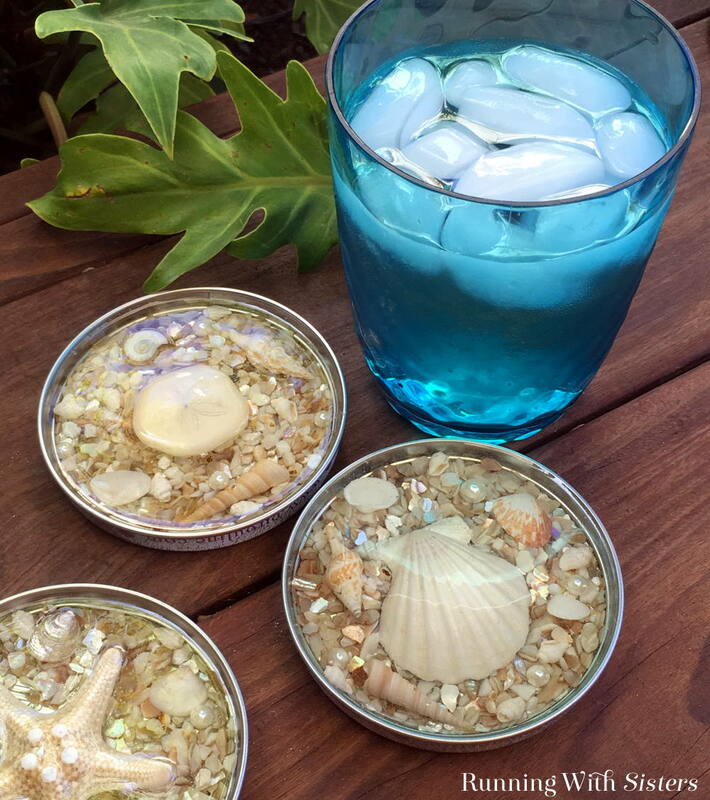 With a jar lid, your own collection of seashells, and homemade resin, you can create coasters that came directly from the shoreline. You can craft your very own shell-filled set by following the instructions at Running with Sisters. Do you want to share your love of the sand, saltwater, and ocean air with everyone? 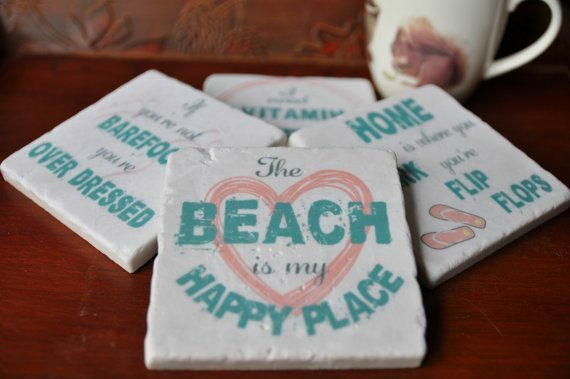 An expressive set of marble coasters featuring beachy sayings is the perfect way to do so. From flip flops to “vitamin sea” to barefoot in the sand, let your coasters speak for you and bring the beach into your home via SassySquirrelInk’s Etsy shop. Golden nautical anchors and deeply colored rosewood make for a high-class spin on coastal accents. With a set of dark wood coasters featuring a small hint of spending summer days on the sea. Place this set, available at our store, on your coffee table and add a splash of the harbor. There are just certain images that bring the beach to life: anchors, seahorses, nautical compasses, and of course seashells. Why not add those images to your home? Adorn your tables with this beach-themed coaster set, each outlined in rope that reminds you of bright summer days on the coast. Get your set from The New England Beach Co on Etsy. Prefer spending your beach days on a boat? 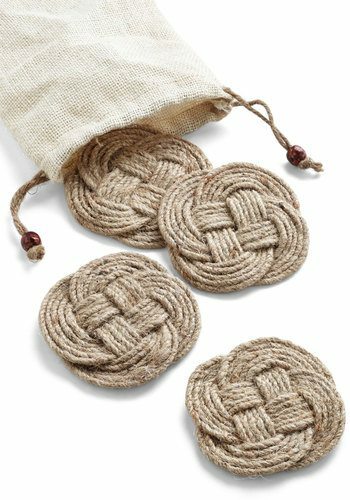 If so, the perfect companion to add to your beach home is a subtle nod to the nautical life: natural rope coasters tied in a traditional nautical knot. Adorn your tabletops with these sand-colored nautical knots, available at ModCloth, and seamlessly tie together your entire coastal décor theme. 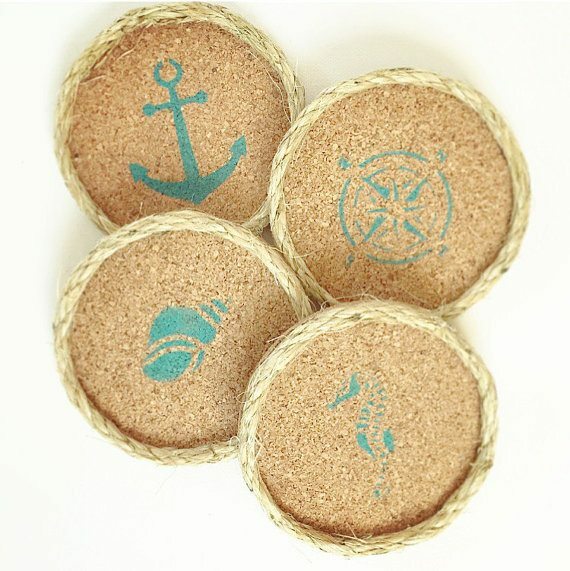 Forget plain old cork – boring coasters are in the past with these beachy options. From shells to sea life, every one of these coasters is a reminder of the coastline. You can add a touch of your favorite sandy spot and ocean spray to your home with any of these sea-themed coasters. Love this list? Share it with your beach-loving friends, and let us know which of these coastal sets you’ll be adding to your own home in the comments!